We at Geeky Hobbies would like to thank Digidiced for the review copy of Le Havre: The Inland Port used for this review. Other than receiving a free copy of the game to review, we at Geeky Hobbies received no other compensation for this review. Receiving the review copy for free had no impact on the content of this review or the final score. Based on Uwe Rosenberg’s board game, Le Havre: The Inland Port has two players competing to score the most points by building up the port of Le Havre. To do this the players need to acquire resources and money which are used to purchase building tiles. These building tiles are used in future turns in order to gather additional resources and money. Players will earn victory points from buildings, money on hand, special buildings, and resources (if they own certain buildings). After twelve days whichever player has the most points wins the game. While I am not going to detail the gameplay as much as I do with board game reviews, I have to say that I really enjoyed the gameplay in Le Havre: The Inland Port. Le Havre: The Inland Port is what I would consider a moderate level strategy game. The game is not highly difficult to play but it does require quite a bit of planning/strategy. I would say that it is one of those games that you understand how to play pretty quickly but you don’t really understand the strategy behind the game until the end of your first game. Once you get used to the game though it is pretty easy to play. I think there are three main strategies in the game. The most straightforward strategy is to get the resources needed to purchase the buildings worth the most victory points. This strategy is very straightforward but also works really well. Another option is to acquire a bunch of resources that you then sell off to earn money. I don’t think this strategy will work on its’ own but if you combine it with buying valuable buildings you should be able to earn a lot of victory points. The final strategy is more of a late game strategy as you try to acquire a lot of resources and then score points by acquiring the anchor buildings and the port to score points off the resources you have acquired. You probably aren’t going to be able to fully focus on any of the strategies but mixing the strategies together is what makes Le Havre: The Inland Port interesting. While a lot of the mechanics in Le Havre: The Inland Port are similar to those used in other games, the one mechanic that is the most interesting is the resource board. In most games you just acquire and use resources with no strategy on how you use them. In Le Havre: The Inland Port resources are handled on the resource board so you need to think about how you use your resources. In order to gather and use resources you move the resource markers around the board. This actually adds a lot of strategy to gathering resources. Instead of just acquiring as many resources as you can, you also have to worry about the current position of those resources on the board. You can gather a lot of resources quickly by just going straight up the left side of the board but then you will be forced to use resources in increments of three no matter how much of the resource you actually have to use. Instead you need to try to move your tokens up, left, and right at the same time to move your tokens toward the upper right side of the resource board so you can have more flexibility later in the game. I give the game a lot of credit for actually adding a lot of strategy to something as mundane as resource management. One of the biggest questions most people have with board game apps is how well the app implements the board game. For the most part I really like the implementation of Le Havre: The Inland Port. I have never actually played the board game version of the game but it looks like the app does a very good job implementing the board game. The interface is straightforward and it is quite easy to navigate. The game only has two different screens with one screen showing your resource board and the other shows all of the buildings. One issue I had with the interface when I first started playing the game was that there was a lot of scrolling while looking through the buildings. I then found the button that lets you see all of the buildings on a given space at the same time which eliminated the need for all the scrolling. A couple weeks back I looked at Agricola: All Creatures Big And Small which was also created by Digidiced. My biggest complaint with that game was the fact that I didn’t like the tutorial since I was still kind of confused about the game after playing the tutorial. I ended up reading the rules for the board game version of the game to fully understand the rules of the game. The same problem is not present in Le Havre: The Inland Port. While the game takes a while to adjust to, the tutorial for Le Havre: The Inland Port is quite good at teaching you the rules of the game. I give the game a lot of credit since Le Havre: The Inland Port is a moderately difficult board game that takes some time to fully understand and yet the tutorial does a good job teaching you everything you need to know to play the game. 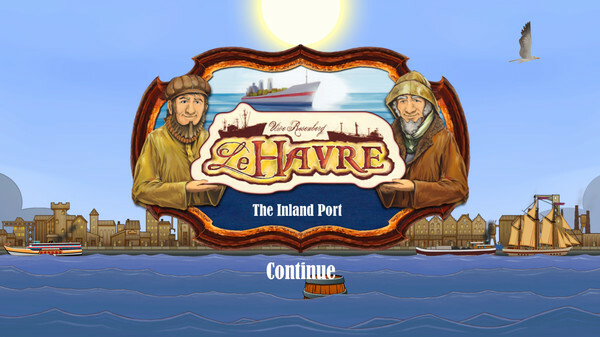 Being a two player game you need someone to play the game against and Le Havre: The Inland Port allows you to either play against the computer AI or another player. While I will get to the computer AI shortly, most of your time with the game will probably be played against another human player. While I haven’t yet played the online mode of the game, the game works well locally. The online mode lets you play against friends and has a ranking system where you can set up a random game with another player of the same skill level. The only issue I see with the multiplayer is the fact that the game takes considerably longer than it does playing against the computer since both players have to think out their next move. The online version of the game does have the ability to have the game notify you when the other player makes their move so you can do something else while waiting for the other player to make their move. The game can take quite a while though if you play with someone with analysis paralysis. So let’s talk about the computer AI. While it is probably going to be better playing against another player, if you don’t have another player to play against locally or don’t want to play the game online it is nice that you can play against the computer. So far I have played three games of Le Havre: The Inland Port. The first game was against another player and the other two games were against the computer. In my second game I played against an easy computer as I was still learning the game and I absolutely destroyed the computer. I almost doubled the computer’s score with around 250 points to around 130 points for the computer. Unless you have no idea what you are doing or make a colossal mistake you shouldn’t lose to the easy or very easy computer. In my third game I played against the medium level computer. This game was quite a bit closer since I only won by 20-30 points. The medium computer provides a decent challenge and will actually mess with your strategy at times. If you don’t make any big mistakes though you will probably regularly win the game. If the hard difficulty ramps the difficulty up similar to the medium difficulty I think the hard difficulty will be pretty challenging. One of the better reasons to purchase a lot of board game apps is the fact that the apps are usually considerably cheaper than the actual board game that they are based off of. This is true for Le Havre: The Inland Port as well. Le Havre: The Inland Port app retails for $10 (on sale for $6.99 until September 5th, 2016) while the board game usually retails for around $20. While this app doesn’t have as big of savings as some of the other board game apps, you can still save $10 by purchasing the app version of the game. Generally I prefer having the actual board game over the app version of a board game. In the case of Le Havre: The Inland Port though I am not so sure. The app version of the game is so well done that outside of being able to touch the physical components, I don’t see any real differences between the two games. The interface is well done and the game does a good job teaching you how to play the game. The computer AI is solid (on the higher difficulty levels) and the game includes online play so you can play against opponents of the same skill level. On top of all of that Le Havre: The Inland Port is just a very good board game. I would highly recommend Le Havre: The Inland Port if you are looking for a good moderately difficulty board game. Pretty easy to learn but has a lot of strategy. Does a great job implementing the board game into a video game. Takes a while to fully understand the strategy of the game. The computer AI is on the easy side especially on the lower levels.